1. 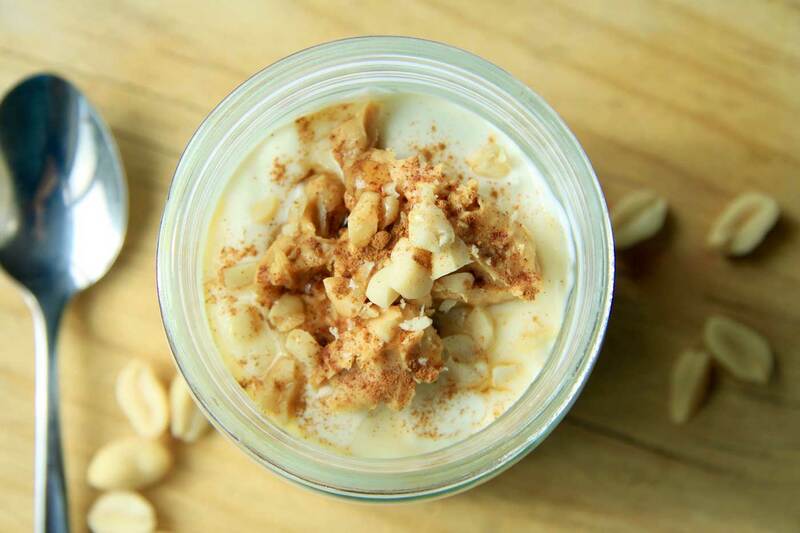 In a mason jar or bowl, mix together oats, milk, vanilla, salt and any additional flavourings. 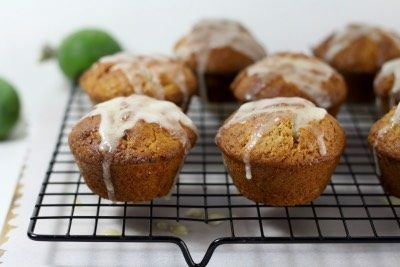 Top with yoghurt, cover and refrigerate for several hours up to overnight. When ready to serve, add toppings. 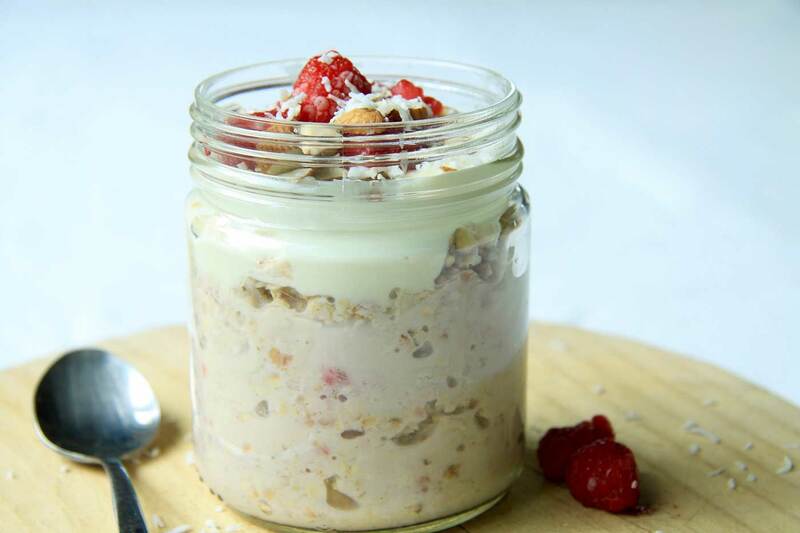 A mixture of oats, yoghurt, milk and favourite additions are soaked overnight to make an easy and wholesome no-bake breakfast on the run. Raspberry Coconut / Banana Bread / Peanut Butter Lover style. 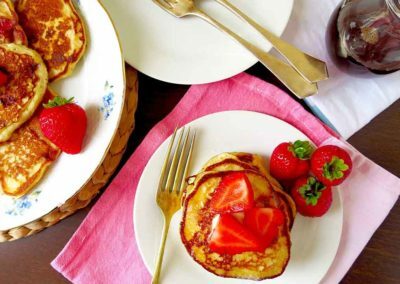 The easiest, wholesome and quick breakfast! 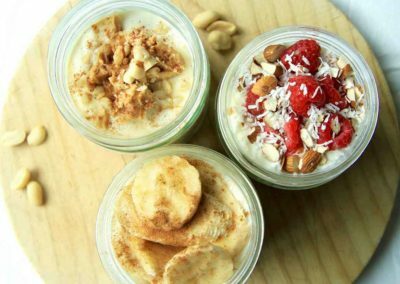 Overnight oats are creamy and wholesome and although they have been a fad for a while now, I still love them. What’s no to love about them though? 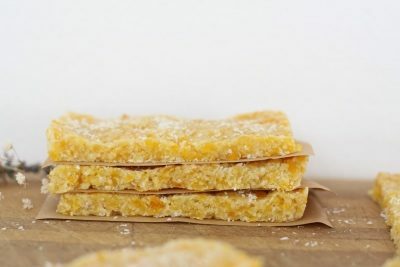 They are quick and easy to prepare and are all ready to greet you in the morning when you’re feeling too sleepy eyed to think about making breakfast. 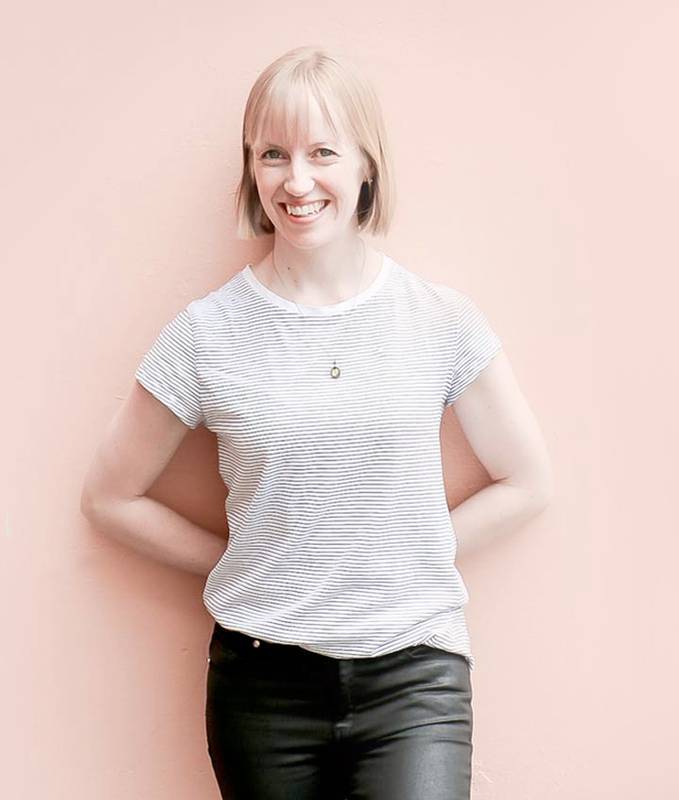 It was my friend Hayley who asked me to share a recipe for overnight oats as she has been making this one for some time now and was in need of something else to add to her breakfast repertoire. 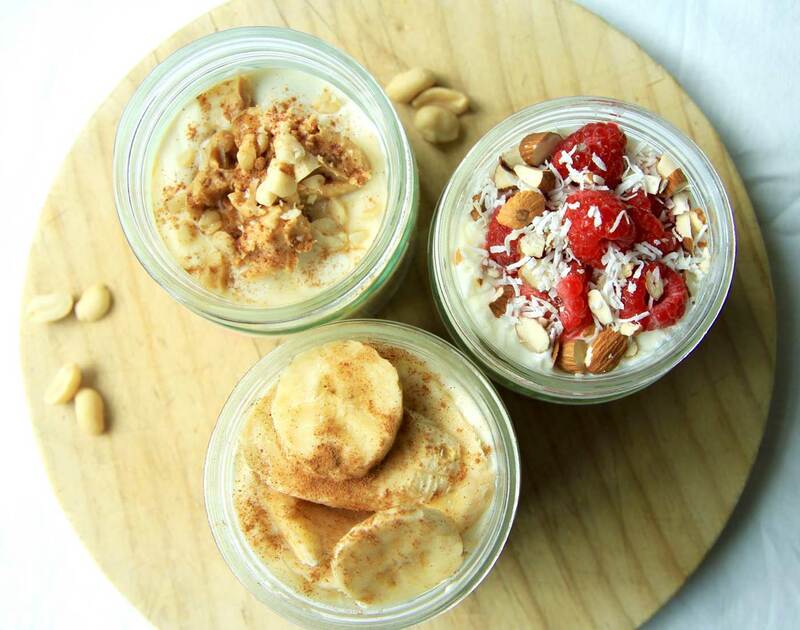 So I thought I’d share this recipe for overnight oats 3 ways. Hope you enjoy! 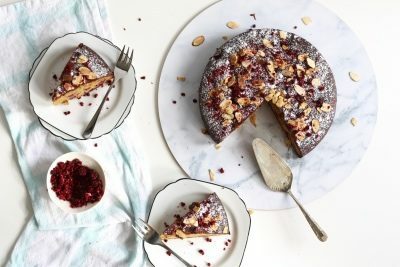 Topped with almonds, more coconut and more raspberries. It’s so creamy and delicious. This flavour reminds me a lot of ambrosia but a much healthier, acceptable breakfast version. 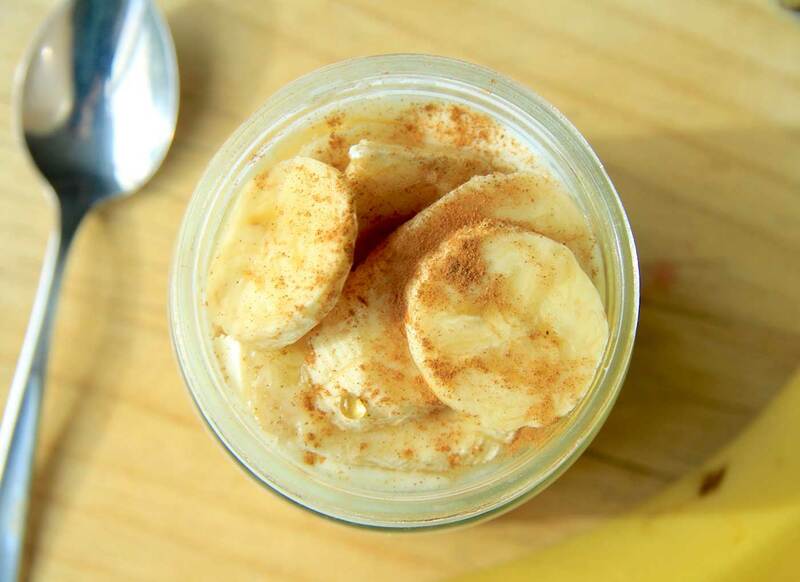 A mixture of oats, milk, yoghurt, mashed banana, flaxseed, cinnamon and maple syrup makes you feel like you’re eating banana bread from a jar – it’s sooo good. Sometimes I like to add peanut butter for an even heartier flavour and extra protein. For all the fellow peanut butter lovers out there. 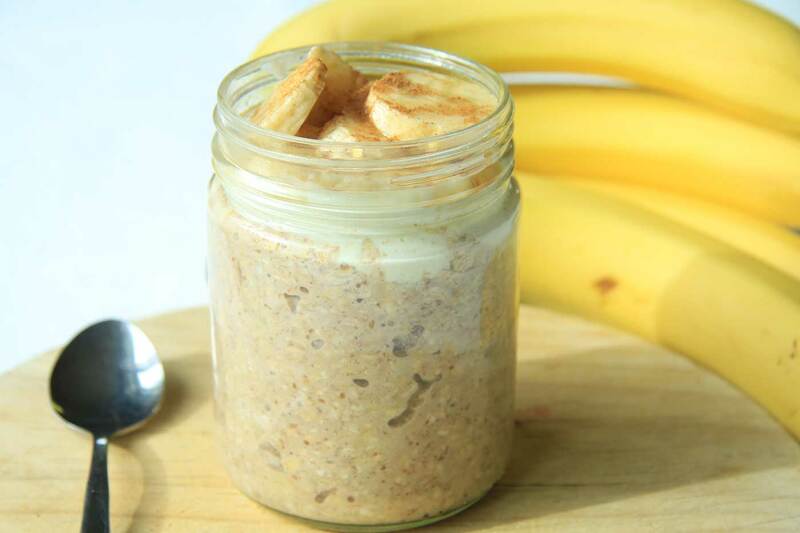 This is probably my favourite way of eating overnight oats. 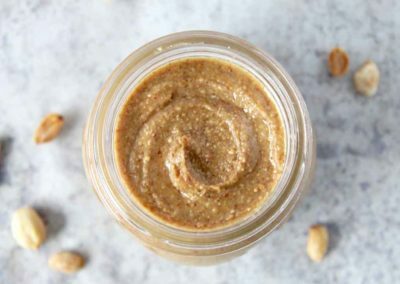 If you’re not a peanut butter fan, you could try adding any other nut butter instead or even nutella for a decadent, sweet breakfast treat. A sprinkle of cocoa on top is delicious too! If you are wondering what the difference is between overnight oats and bircher muesli, there’s pretty much no difference other than the name and flavourings. 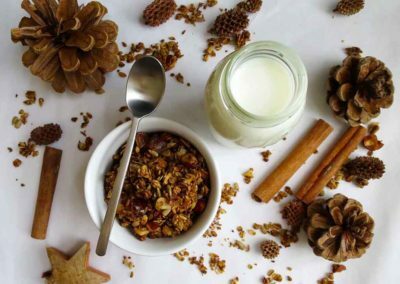 Typically bircher muesli has grated apple and dried fruit in combination with oats, milk and yoghurt. 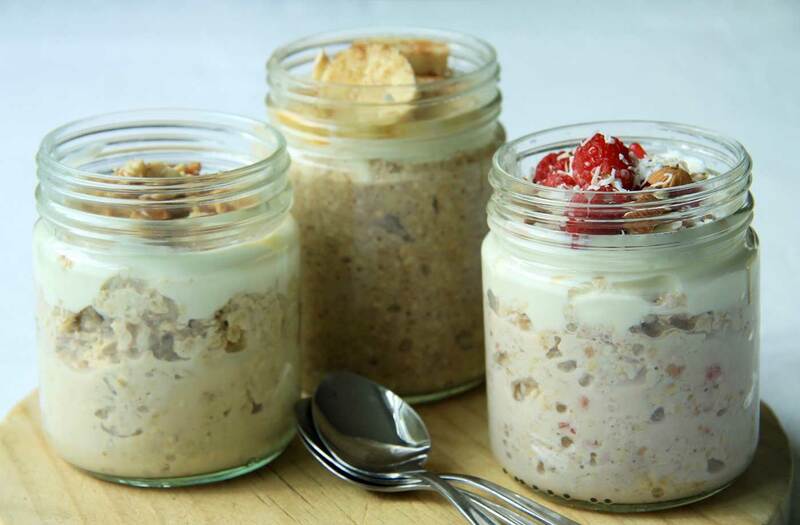 Overnight oats however can be a mixture of oats, yoghurt, and any other flavourings of choice. 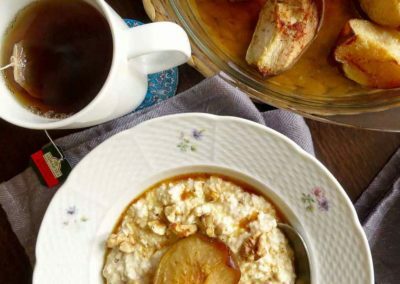 So really, there’s not a lot of difference at all other than bircher muesli is more ‘traditional’ and overnight oats leave more room for creativity. Well at least, that’s my take on it. 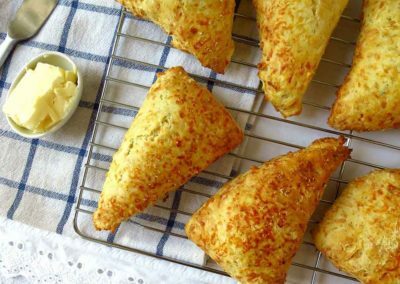 You can easily make these overnights 3 ways gluten and dairy free. Just use gluten free oats and/or buckwheat (I like to blend this up after it has been soaked), dairy free milk and yoghurt (e.g. cashew, coconut, soy etc.). 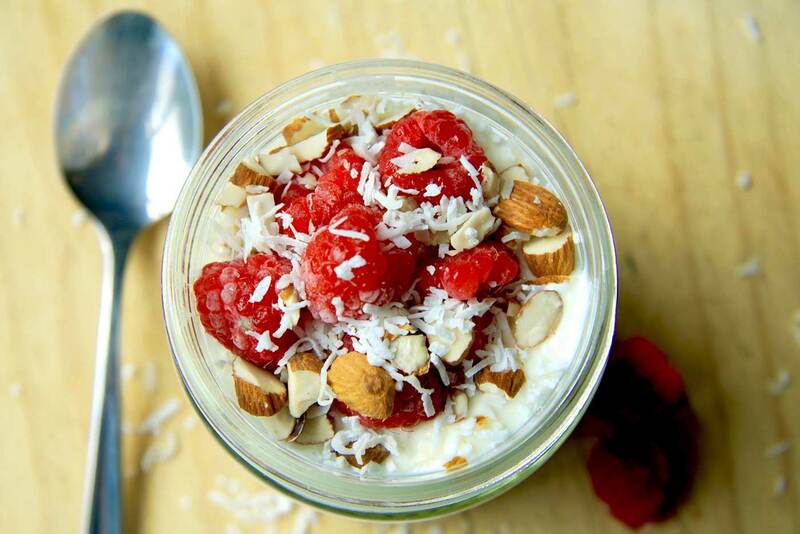 How do you like to eat overnight oats? Have you got a favourite flavour you enjoy?